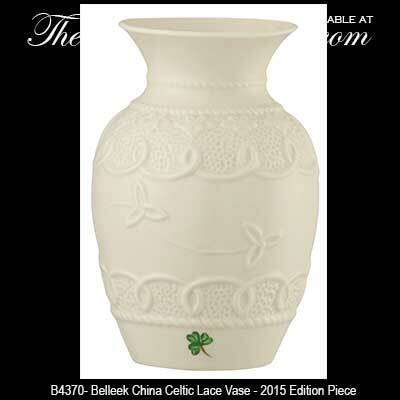 The Belleek China Celtic lace vase is the 2015 edition piece. This Belleek China vase was introduced in 2015 and it takes its inspiration from ancient design and the delicate handcraft of Irish lace making. The combined themes found in both styles add to its distinctive decorative appearance. A hand painted shamrock is found near the base of each piece and it has an exclusive trade stamp with the personalized signature of the designer, Majella McManus. This Belleek vase features an embossed Celtic motif along with a hand painted green shamrock. The fine china Irish vase measures 4" wide x 6" tall and is handmade and hand painted in Belleek, Ireland. The Belleek Celtic lace vase is gift boxed with Celtic knot and shamrock history cards that are complements of The Irish Gift House.